Drift began in the sea and through our Spring and Autumn retreats in St Ouens Bay, Jersey we have explored our connection to Mother Nature, digitally detoxing and indulging in wild adventures. Next year we journey to the mountains and embrace the winter season; traditionally a time for hibernation and hunkering down; we will be getting in touch with the incredible elevation and altitude we have so close to our Island home. Unlike the ocean which is always moving, with shifting tides and changing swells; the mountains are a stable force, a great place for practicing equanimity. The snowy peaks are a pristine playground for anyone looking to feel the freedom of gliding in union with gravity and if you’re lucky, experience the most sacred of all conditions - fresh powder! It heralds the sister sensation of wave sliding, there are so many similarities. Snow is after all, simply frozen water and will eventually find its way into the ocean. Just like us Drifters! Standard snow holidays tend to centre around adrenalin fuelled slope action, with plenty of heavy, rich food, boozy “apres ski” and late nights that can leave us wired, broken and fuzzy. Which is why we have designed the ultimate Snow Drift retreat, utilising body awareness through our yoga practice to strengthen, stretch and minimise injuries, healthy food to nourish and meditation for a clear mind. We believe in harnessing the mountain prana, the energy of this region, allowing it invigorate our body, mind and spirit and sending us home feeling fuelled and enlivened. On a Drift retreat Mother Nature dictates our schedule of activities, which is why Snow Drift centres around building our connection to the mountains through our yoga practice and enjoying the Alpine environment in a balanced way. Whether you’re a seasoned skier looking for a healthier alternative to a chalet holiday or have never tested out the slopes before, we are here to support and arrange everything you need to make your snow time as enjoyable as possible. Yoga instructor Nat spent the full season in Morzine last year as a resort rep and is on hand with ideas on where to go explore depending on conditions and your ability; there's 7 parks in Avoriaz... gentle, beginner friendly areas in Les Gets... St Jean valley when there's fresh powder! You'll be in the Portes Du Soliel ski area which is the largest in the world! A stones throw from Switzeland and with views of Mont Blanc. It's a sensational area full of diversity and fun for everyone! Depending on your level we can arrange more lessons, off piste guiding or you are free to roam on your own. We have a Drift plan which you are more than welcome to follow but whatever you decide we will make sure you will have as much time on the mountain as you desire. At DRIFT we see yoga as a pathway to more awareness, acceptance and a deeper experience of "what is". It is essentially tapping into the power of the heart, to reach the energy of creation that connects us all. Drift Snow is about cultivating balance and equanimity by combining both Yin and Yang yoga. Vinyasa Flow is to move, strengthen, stretch and breathe - synchronising breath with movement to build awareness of the whole body; creating flexibility, stability and coordination; and following alignment principles to allow more energy flow throughout. We use yin yoga to relax and restore, our intention is to embrace stillness, practicing deep breaths and long holds, whilst working to delve into the fascia, connective tissue and reach the organs through the Chinese meridians. More static, floor based and rooted in mindfulness; it is a functional approach and accessible to all. We begin our days with a morning ritual of Vinyasa Yoga, a dynamic flow waking up all the muscles we will using on our board or skis. Drawing into a centre space with our breath, it is the best way to get us focussed, flexible and calm for an action packed day on the mountain. This dynamic style is specifically designed as a warm up for the movements we will be exploring on the slopes. In the afternoon, we have yin yoga, the perfect way to stretch out tired and aching body parts, rooted in relaxation and with an absence of standing postures. The afternoon class is more about winding down with an easier session designed to stretch out the muscles used in the day’s activities and usually incorporating elements of meditation. After dinner there will be 2 evenings with candlelit yoga nidra or a guided meditation which allows you to relax each and every body part consciously and is an incredible aid to a peaceful nights sleep. Our beautiful chalet is located in an unbeatable position right in the centre of Morzine’s old town. It is a short 4-minute walk to the Pleney bubble (for access to Morzine and Les Gets), 100 meters to club Piou Piou and 200 meters to the bus links to Avoriaz, Super Morzine and Nyon, not to mention a stone’s throw to the resort’s centre shops, restaurants and bars. The chalet was recently renovated, creating a space to relax and unwind in after an exhausting day on the slopes. Blending the traditional Savoyarde feel with a modern finish has created a beautiful space for you to enjoy. 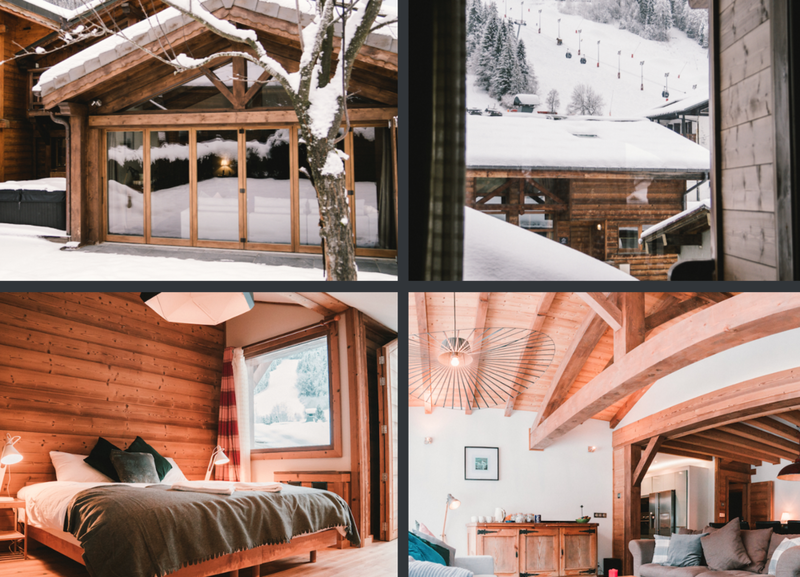 The chalet also offers a large outdoor hot tub, heated boot room to keep your ski jackets and boots warm for the next day, secure ski/board locker and off road parking for two cars. The chalet has Wifi, Netflix and bluetooth speakers and an iPad with Spotify, so if unwinding with entertainment in the evening is the plan, we can do so in style. - Free time to book a massage, visit the local village, relax and read! A deposit of £400 is required to secure your place. Contact me for more info and booking.